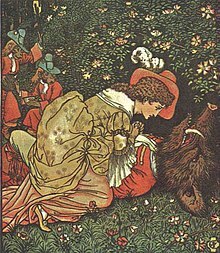 Beauty and the Beast, Walter Crane tomonidan tasvirlangan. Sohibjamol va Maxluq (Fransuzcha: La Belle et la Bête), Fransuz yozuvchisi Gabrielle-Suzanne Barbot de Villeneuve qalamiga mansub bo‘lgan fantastika janridagi ertak. Kitobning syujetiga ko‘ra, bir shahzoda (keyinchalik maxluq) sevgilisini kutar edi. Maxluqni kimdir chindan sevib qolsa, u shahzodaga aylanadi. ↑ Windling, Terri. "Beauty and the Beast, Old and New". The Journal of Mythic Arts (The Endicott Studio). Archived from the original on 26 July 2014. https://web.archive.org/web/20140726163822/http://www.endicott-studio.com/articleslist/beauty-and-the-beast-old-and-new-by-terri-windling.html. ↑ La Belle et la Bête. Biblioweb. Wikimedia Commonsda Beauty and Beast mavzusiga oid fayllar bor. Bu sahifa oxirgi marta 15-Fevral 2019, 17:34 da tahrir qilingan.